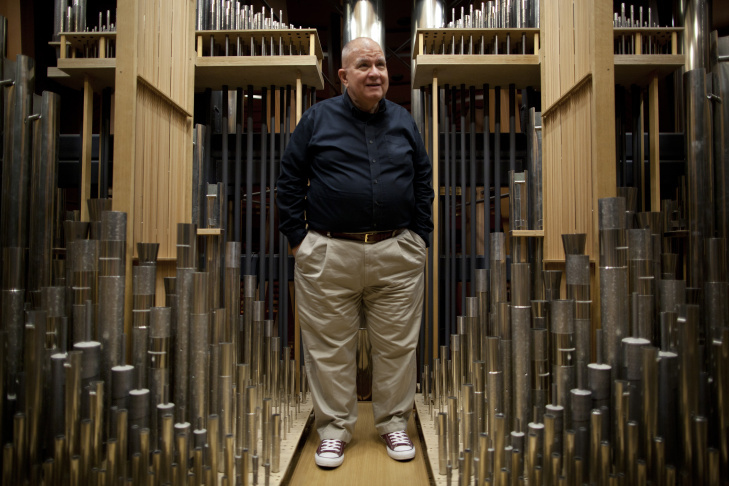 Manuel Rosales built the organ at the Walt Disney Concert Hall in conjunction with a design from architect Frank Gehry. The organ turns 10 years old this month. 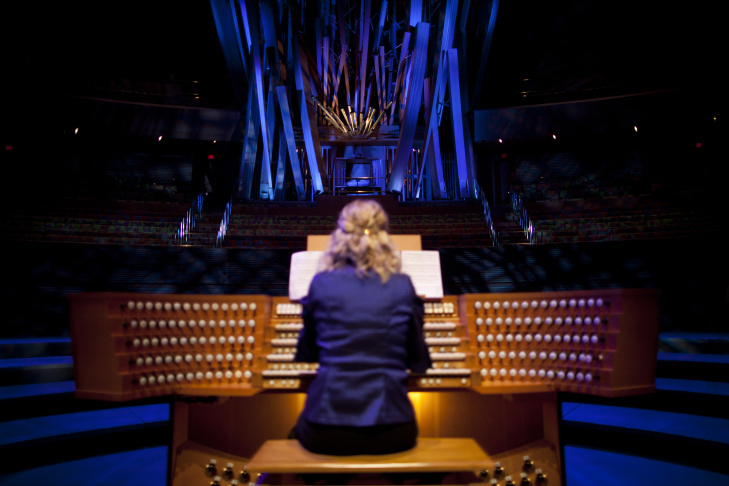 Joanne Pearce Martin plays the organ inside Walt Disney Concert Hall. 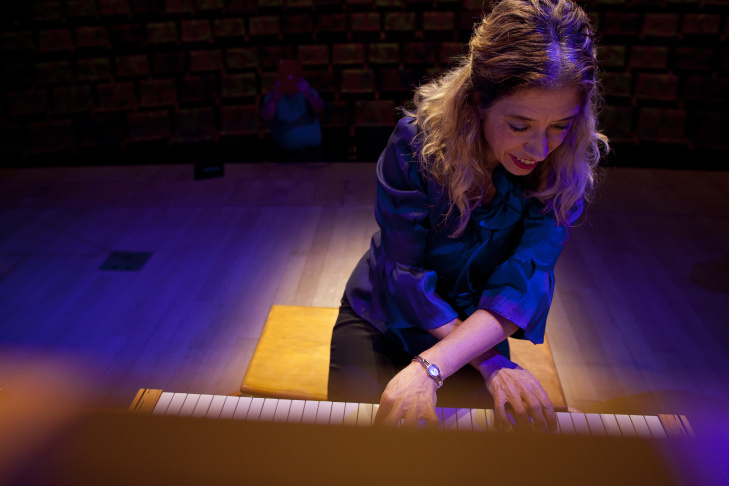 She is the principal keyboardist for the Los Angeles Phil Harmonic. 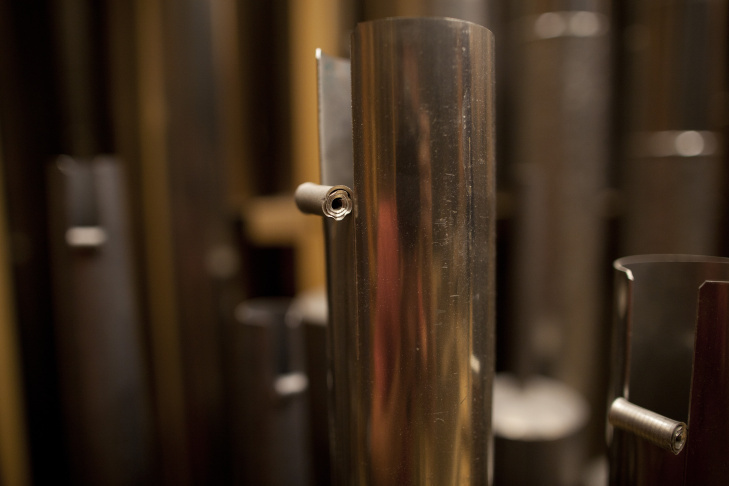 The organ at the Walt Disney Concert Hal consists of more than 6,000 pipes. Principal keyboardist for the Walt Disney Concert Hall, Joanne Pearce Martin, plays the organ that turns 10 years old this month. 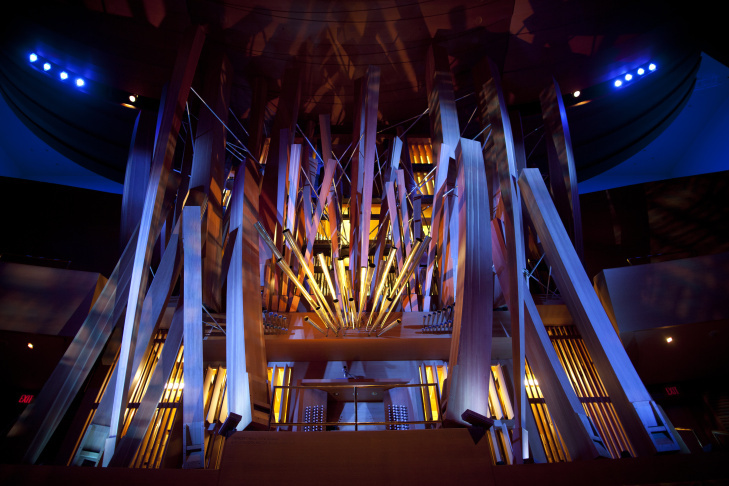 The organ at the Walt Disney Concert Hall has a variety of instrumental sounds and pitches it can produce. 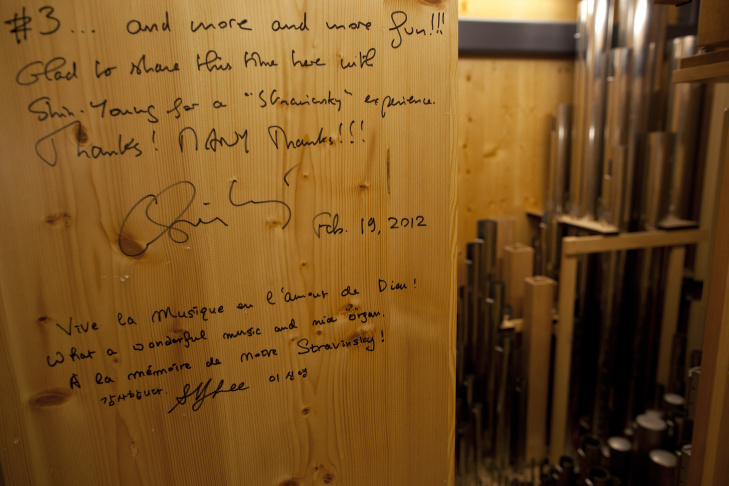 A tradition at the Walt Disney Concert Hall is for each person who plays the organ to sign a wall inside one of the spaces where the pipes are housed. The technique to tune an organ pipe looks similar to peeling back a sardine can. The organ inside the Walt Disney Concert Hall turns 10 years old this month. I raised some eyebrows when I asked the L.A. Phil's Joanne Pearce Martin to play "Happy Birthday" on the Disney Hall organ. But she did so with gusto, as you can hear if you'll click the Listen Now button on the left. And why not?! 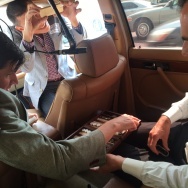 The orchestra is marking the tenth birthday of its signature pipe organ this month, with those huge wooden pipes that look like a box of french fries. 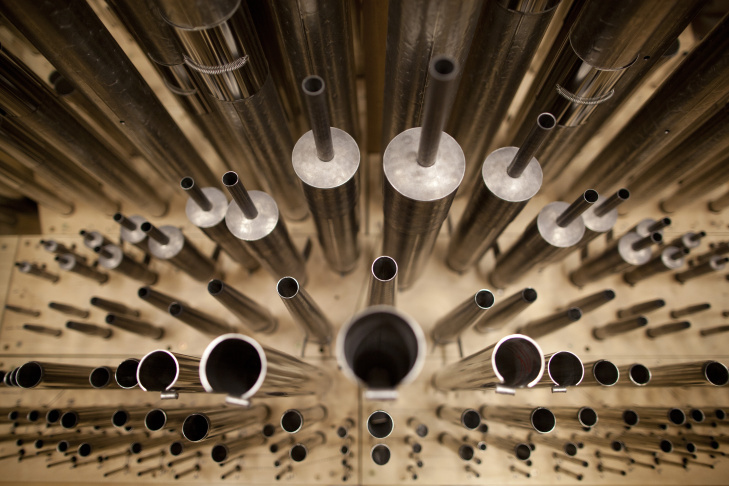 The organ is a work of art and a musical instrument, but it's also a huge machine, one you can walk around the inside of, and from the inside — way up above the Disney Hall stage, above the organist's perch — you can see the pipes and fully appreciate the way they work together. That's where I talked with Manuel Rosales who built the organ (with German company Glatter-Gotz Orgelbau), and who demonstrated it with help from organ conservator Philip Smith, who played the organ from a console way down on stage. The organ is a living, breathing object? 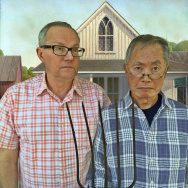 It's complicated and each pipe is like its own musical instrument. And each pipe ages in its own way. Yet it has to be commingled with over 6,000 other pipes. So the way they sound today isn't the way they sounded 10 years ago. 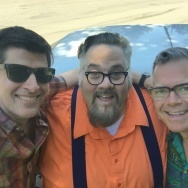 We can't say it's like fine wine that gets better with age; the molecules in the pipes soften and the tone mellows. But they don't lose their shimmer or their power. Do other instruments have the organ's personality points? A piano does, but it's very subtle. A harpsichord does. Harpsichords are the enfant terrible of the keyboard world. They change overnight — they can change in an hour. Organs are not quite that temperamental. But unlike an instrument that you can pick up and walk away with ... this has to all be done here. So we come to the organ on its terms, and we have to make the decisions of how we take care of it. Do other concert halls have purpose-built organs like Disney Hall? Some go back to the 1920s or so when those concert halls were first built. Some got rid of their organs or didn't maintain them and they just walled them up, like the Cleveland Orchestra. 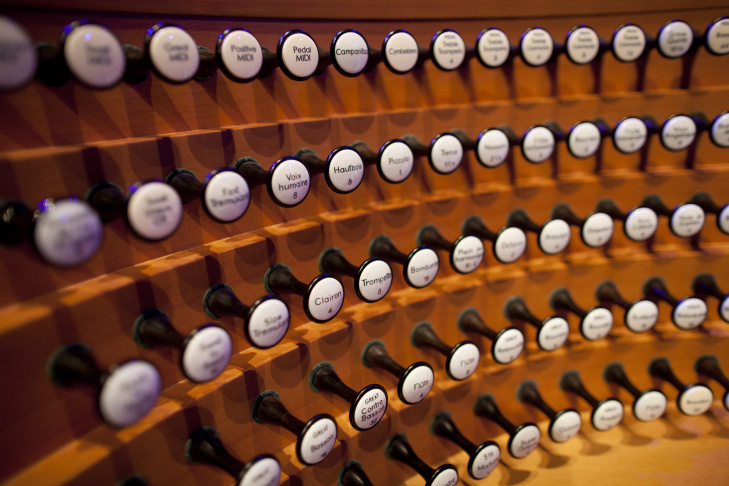 There are new concert halls — the one in Dallas has a beautiful organ, the one in Philadelphia; down in Orange County there's an instrument in the Segerstrom Hall. So it's become popular again to have organs. And people like coming to concert halls because there are fewer restrictions on the kinds of music that you can play. He built it; is he proud as the organ turns 10? I'm real lucky to be here. That's the main thing. Many organ builders get to build organs in nice halls or nice churches, but they're a thousand or three thousand miles away. I'm 15 minutes away. So this is like my other living room. And check out the extra audio: My first piece on the Disney Hall organ, when it was a "newborn" in 2004.